To me, a Yorkshire girl, heathland has always meant hills, heather and windswept moor. It took me about one hour in my new role to realise that the lowland Brecks heath is an entirely different world. Looking out over Norfolk Wildlife Trust’s East Wretham Heath, your first impression may not be a bustling hub of biodiversity. But when you stop and look closely at that short, rabbit-grazed turf, you see a rich mosaic of mosses, lichens & flowering plants, supporting a world of invertebrates (beetles, bees, butterflies & moths). The bare patches of sandy soil warm quickly in the warmer months, making them ideal places to bask or lay eggs. If you’re a Stone Curlew the flint stones dug up by rabbits camouflages your eggs too (hence the name Stone Curlew!)! There are species here that live nowhere else in the UK, and even some that live nowhere else on earth! But the most important animal, for me, is the one that shapes this habitat and allows this diversity to flourish – the Brecks’ bunnies. The grazing & burrowing of rabbits creates the conditions that rare/endangered species need to survive. But rabbit numbers have been falling here continuously since the 90’s, so the Brecks heaths are becoming overgrown by coarse grasses and shrubs, forcing the Breckland’s less competitive rare plants and insects out. 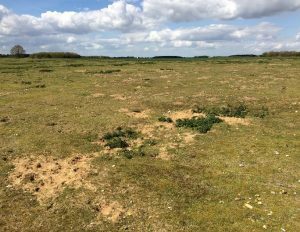 But 2019 will see the Shifting Sands team begin field trials to encourage and enhance rabbit populations across 5 Breckland sites! 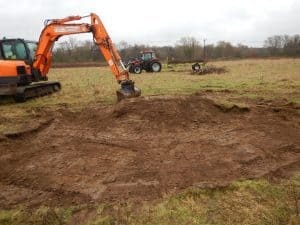 Today, our project partner, Suffolk Wildlife Trust, began works at Lackford Lakes Nature Reserve, creating the first Shifting Sands rabbit habitat enhancement plots. These plots have been specially designed, with the expertise of Dr Diana Bell (University of East Anglia), to encourage rabbit burrowing and breeding. Over the next month, more plots will be created at sites owned by our other partners, Norfolk Wildlife Trust, Elveden Estate & Natural England. Then, our focus will be monitoring; training volunteers to undertake the monthly rabbit counts, checking camera traps, and taking warren censuses. Do get in touch if you want to get involved! It’s been a fantastic, fascinating, busy first month with Shifting Sands. Keystone Species Officer, Shifting Sands.